The CBP officers arrested the smuggler, a Mexican national who attempted to drive the drugs across the border. The suspect was a part of the DHS’s trusted traveler program called FAST, that stands for free and secure trade for commercial vehicles. NO MORE CARAVANS...BUS THEM BACK HOME! Federal and local authorities teamed up to seize two truckloads of methamphetamine and marijuana this week after they spotted “two trucks avoid a border checkpoint and drive into an uninhabited desert area with their lights off,” according to the Maricopa County Sheriff's Office. The drug haul on Wednesday yielded roughly 200 pounds of meth and 3,500 pounds of weed, the Maricopa County Sheriff’s Office said in a news release. The department collaborated with Customs and Border Protection agents as part of the County Drug Suppression Task Force (MCDST). Authorities operating near Gila Bend spotted “two trucks avoid a border checkpoint and drive into an uninhabited desert area with their lights off,” the sheriff’s office said. Tire deflation devices were set up and the vehicles “were rendered inoperable” after coming in contact with them, they added. Four suspects allegedly took off from the area on foot, the sheriff’s office said. Ever wonder what $2 million in methamphetamine and marijuana looks like? MCSO detectives intercepted two trucks carrying these drugs bound for our streets. Working with CBP agents they seized 220 pounds of meth and 3500 pounds of marijuana and caught three suspects after they fled the vehicles. This operation was part of the Maricopa County Drug Suppression Task Force, a collaboration between area agencies. The apprehended suspects – who were identified as Jose Jaime Garcia-Lopez, Yoni Ontiveros-Torres and Ruben Espericueta-Jiminez – were booked in jail on charges of possession and transportation of dangerous drugs for sale and possession and transportation of marijuana for sale, the sheriff’s office said. “This seizure is an example of exceptional police work by our deputies and law enforcement partners,” Sheriff Paul Penzone said in the news release. “It is also an example that the demand for drugs continues to be epidemic. Illicit drugs are the most impactful contributor to violence, crime and gang activity that continues to adversely impact our community and our families. We will be unwavering in our commitment to hold the line." "...fentanyl is very likely a viable option for a chemical weapon attack by extremists or criminals." 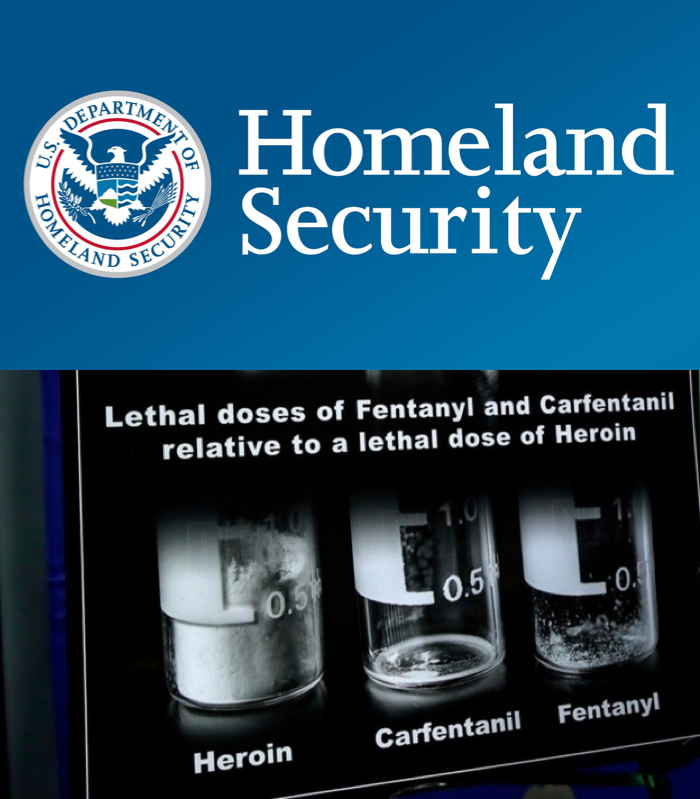 Dated Feb. 22, 2019, under the title "Use of counter-WMD authorities to combat fentanyl," the memo said the toxic painkiller would be identified as a WMD "when certain criteria are met," and that DHS officials have "long regarded fentanyl as a chemical weapons threat." Fentanyl is one of the most potent synthetic opioids out there, is considered to be 100 times more potent than morphine. Pain management physicians prescribe fentanyl to patients who experience severe pain but is also sold illegally. 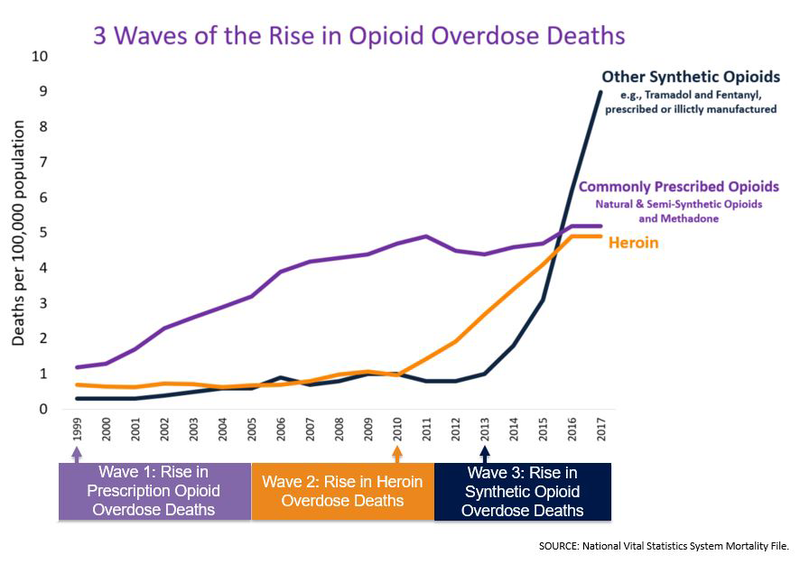 The illegal form of fentanyl has been responsible for a massive spike in opioid-related deaths from 2011 to 2018. In 2017, approximately 28,000 Americans fatally overdosed on the drug. James McDonnell, an assistant secretary at DHS, detailed in the memo that the drug's high toxicity and widespread availability "are attractive to threat actors seeking nonconventional materials for a chemical weapons attack." McDonnell wrote that "as little as two to three milligrams of fentanyl can induce respiratory depression, respiratory arrest, and possible death." He said some fentanyl analogs are even more dangerous. 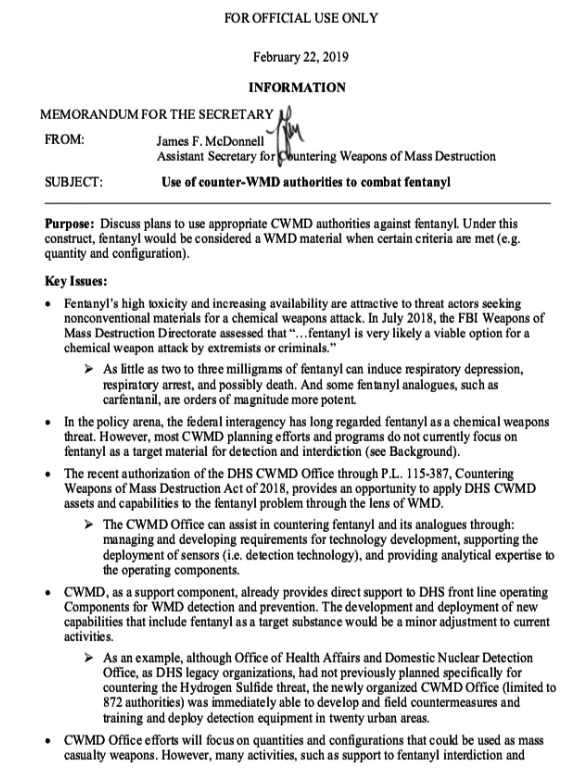 Dan Kaszeta, a chemical and nuclear defense expert, spoke with Task & Purpose about the fentanyl threat being used as a WMD as a "fringe scenario" since there are "literally dozens" of other chemical substance that could be weaponized. 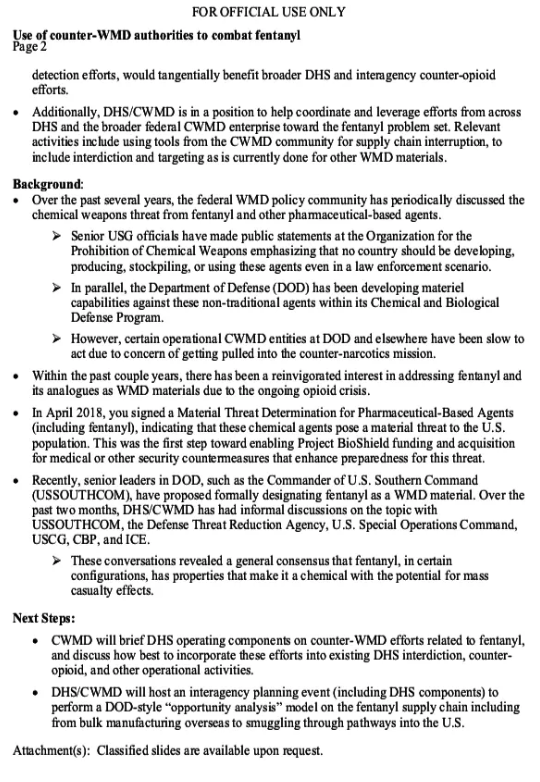 At the end of the memo, McDonnell said his office will brief government officials on combatting the fentanyl WMD threat.